Some Fringe productions make ideal late night shows, and John Schultz’s TILL BIRNAM WOOD… is one of those. 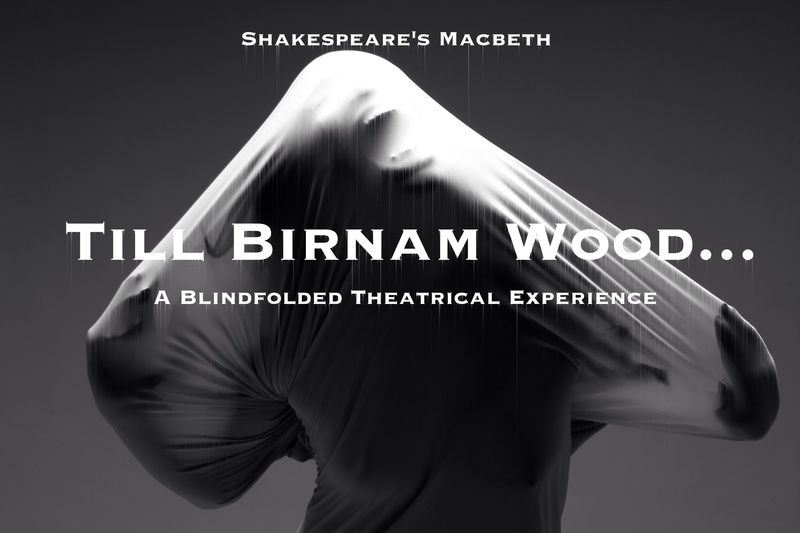 A truncated version of Shakespeare’s Macbeth, it is “an immersive, sensory rendering of Shakespeare’s darkest work, literally”: at the beginning of the show, audience members are given a blindfold. The action takes place all around them, but they can only hear and not see what is going on. After a sold out run at last year’s Fringe, TILL BIRNAM WOOD… is returning to the 2015 Festival for one weekend only. Phindie caught up with the creator and director John Schultz to find out more. [The Philadelphia Shakespeare Theatre, The Space @ 2111 Sansom Street] September 2-5, 2015; fringearts.com/event/till-birnam-wood-6. Phindie: Were your favorite childhood games Marco Polo and pin the tail on the donkey? John Schultz: I never said to no to a game of Marco Polo. I was, actually, obsessed with these video board games in the 90s called Nightmare, that you had to play in the dark. Phindie: Where did you get the idea for TILL BIRNAM WOOD…? JS: I first got the idea for TILL BIRNAM WOOD… when I was working on a production of Macbeth abroad with Teatro delle Due. We were doing eight to twelve shows a week, which gave me a lot of time to listen to the play. It’s funny how many times I hear or see a production of Shakespeare and suddenly have a bit of text hit my ears in a new way. Several of the characters in Macbeth—Duncan, Macbeth, Banquo—say some variation on the line “Whose there?” During one of the Teatro delle Due shows, and despite having heard it dozens of times, it occurred to me that the Scotland Shakespeare crafted was in literal darkness most of the time. These people, in these moments, cannot see. So I took that cue, and decided to see what happens when the play and the audience are literally seeped in darkness. Phindie: What else makes Macbeth ideally suited to this treatment? JS: The language. Working on Macbeth, I didn’t get tired of hearing the text. The text is all over the place; irregular meter, mid-line endings, thoughts that trail off or just stop. All of that, for me as an audience member, makes it particularly engaging to just listen to. Also the violent reaction to the natural world to the story. In the world of Macbeth Nature is reacting in tangible ways to the foul murder of Duncan. The word Nature occurs more in Macbeth than in any of Shakespeare’s other plays and Nature has been referred to as a third major dramatis persona, along with Lady Macbeth and Macbeth, in a lot of scholarship. So I felt between the strange violence of the language, and the opportunity to create the soundscape of the “Nature” in the piece, it would make for a pretty cool ride through the dark. Phindie: What are the challenges to performing to a blindfolded audience? JS: Pacing is the biggest challenge. Just as in radio, any silence that is not intentional can be deadly. Language and sounds are signifiers; if we stop working, the audience stops seeing the play in their mind’s eye. So we have to ride the edge of going fast enough to keep that play happening in everyone’s mind, without losing the audience. Phindie: What kind of feedback did you get from last years’ audiences last year? and people had a lot of kind words. The concept of being blindfolded drew in a number of audience members who normally don’t like Shakespeare. I think we even had a few first timers. Phindie: Why did you decide to bring it back for another Fringe? JS: I hope to take TILL BIRNAM WOOD… to the New York Fringe and Edinburgh in the future and I want to see how it works in a new space, what the remount process looks, feels, and works like. But I had planned to do a remount at some point because we had to turn away a bunch of people last year. Fringe again presented itself as the right opportunity. Phindie: What’s different this year? JS: This year TILL BIRNAM WOOD… is in a new, comfortably air conditioned location [The Space @ 2111 Sansom Street] and we have a few new actors joining the cast. Kevin McGuire will be playing Macbeth, Isa St. Clair will be stepping into the track of Second Witch/ Ross and Dexter Anderson will be taking on Duncan/ Macduff. I’m also planning to add a new surprise or two to the show, for anyone coming back for a second visit. Phindie: Do you have any other recommendations in this year’s Fringe? JS: I’ve had my eye on Purgatory, This Damned Body, and Spookfish. JS: I cannot thank you enough, Phindie!